It's the first and only Kangen Water Demo Presentation in a Brochure "PAPER" Format (4-Fold)! Just read the bullet points on each page panel, follow the brochure flow, and you can do a demo with a prospect in 2-minutes! 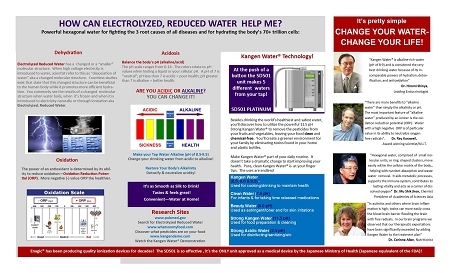 The "Kangen Water Demo Brochure" is intended to get the attention of your potential buyer in 20 Seconds. The design and flow clearly provides your prospects the info they will ever need to understand "WHY" they should to be drinking and using Alkalized Water. Just read the "TOPIC" Headlines and you are actually doing a demo on paper! SPECIAL: Buy 5 Packs, Get 1 Pack FREE! Order Today and you are on your way to 6A and Beyond! !